Saturday withdrawn and replaced by new 238A. Withdrawn between Upton Park and Canning Town / North Woolwich - this section mainly replaced by revised 33. Saturday and Sunday service introduced. Converted to single deck one person operation. Sunday West Ham (WH) allocation transferred to Upton Park (U). Stratford terminal changed to new Bus Station. Sunday converted to double deck operation. MS converted to double deck operation. Upton Park (U) converted to Titan. U and WH allocation transferred to Barking (BK). Regular service to Chadwell Heath Hospital introduced instead of just isolated journeys. Diverted via East Ham Station instead of Upton Park. Withdrawn between Barking Garage and Little Heath / Chadwell Heath Hospital. Re-routed on leaving Stratford Bus Station via Stratford Broadway. STRATFORD Bus Station - BARKING STATION. Withdrawn between Barking Station and Barking Garage. 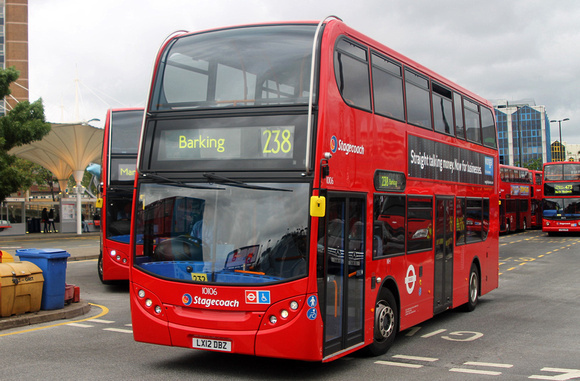 Barking (BK) allocation withdrawn - converted to low floor double deck operation.